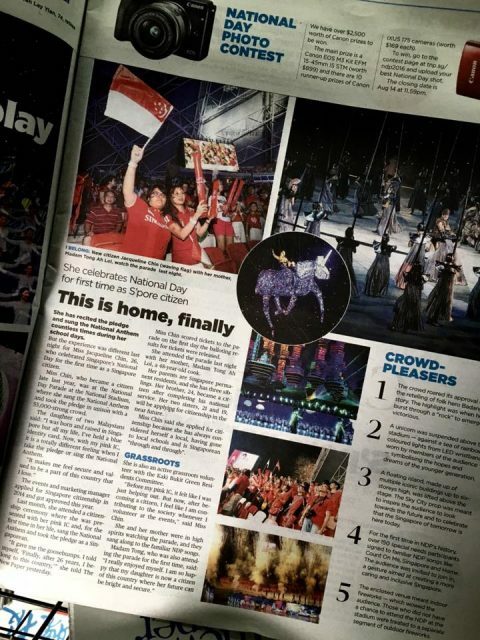 The New Paper (TNP) yesterday shared their story titled ‘She celebrates National Day for first time as citizen‘ in their Facebook. Their story was about how Jacqueline Chin, who had been a citizen of Singapore since late last year (2015), celebrated National Day watching the Parade at the National Stadium with her mother, who is a Malaysian. Several netizens who responded to the newspaper’s Facebook post expressed surprise that she got tickets to the parade. That is until they found out that Ms Chin is an active grassroots volunteer with the Kaki Bukit Green Residents Committee in Aljunied constituency, and that she probably got tickets to watch the parade with her mother, in appreciation of her grassroots activities. In speaking to the newspaper, Ms Chin said that having gone through our local schooling system, she considers herself a local “through and through”. Madam Tong is a Malaysian and a Singapore permanent resident.